Protein shakes are all over grocery store shelves, from protein powders to ready-made protein smoothies. But there are some major problems when you’re looking for high-protein meals on the go: they contain massive amounts of sugar and fillers that spike your blood sugar and trigger midday cravings. Low-carb protein powders and sugar-free ingredients are tough to find. Even harder? Finding a low-carb protein powder that tastes good and fits into your ketogenic diet. So how can you make your protein smoothies keto diet and blood sugar-friendly? Well, it involves more than just making them high-fat. Why a Keto Protein Smoothie? Protein is essential for muscle and tissue growth, repair, and maintenance. They can even aid in weight loss and help you feel full for hours until your next meal. Protein smoothies can offer anywhere from 10-30 grams of protein in an easy-to-drink package, which is especially important if you’re always on the go. Or, if you simply don’t feel like eating meat or eggs at every meal. Your source of protein. Whey protein — especially whey protein isolate is the best, most bioavailable form of protein powder. If you’re allergic or sensitive to whey, use a beef protein isolate. The name of the game with protein shakes is bioavailability. That means you want your body to be able to break down and absorb as many amino acids from protein as possible. Inflammatory ingredients. Ingredients like peanut butter, fillers, and so-called “natural flavors” may not increase carbs in your low-carb smoothies, but they will promote inflammation and may still kick you out of ketosis. Healthy fats. Make sure you’re adding healthy fats like coconut oil, avocado, and MCT oil. The good news is you won’t have to ask these questions when you’re making this specially crafted creamy keto protein shake because it contains everything you need for an energy and brain boost — with none of the blood-sugar spiking ingredients. Whey protein is a highly bioavailable source of protein that fit well into your low-carb diet. Whey protein not only helps to build and maintain muscle mass, but it also helps in post-workout recovery. Whey is one of the most studied supplements for muscle building, and it may even help you achieve the body composition you work so hard for[*]. It achieves this with its full spectrum of amino acids, including branched chain amino acids or BCAAs. These are what do the work to help you achieve your goals at the gym and may even reduce the risks of age-related muscle loss[*]. Coconut milk contains critical fatty acids and minerals like magnesium, potassium, and calcium. These are the same minerals you excrete when you sweat, so it’s important to replenish them post-workout. Coconut also contains medium chain triglyceride fats (MCTs) that provide your body with plenty of easy energy to boost your workout. You may not think of chocolate protein powder when you think of increasing physical performance, but you should! Cacao is packed with magnesium, which is great for muscle, nerve, and cardiac, and overall physical performance abilities[*][*]. Protein has a unique way of keeping you feeling full and satisfied. And the amino acids in whey protein and whey isolate may also help you lose weight, without compromising muscle loss[*]. Coconut is loaded with MCTs that your body can easily break down and turn into ketones. More ketones support ketosis, which helps to curb cravings and aids in fat loss[*][*]. Studies show that nuts like almonds and macadamia nuts may aid in weight loss and improve metabolic health[*]. Similar studies show that people who eat nuts tend to be leaner and have a lower risk of heart disease than those who don’t[*]. A chocolate shake that can improve your gut? With delicious chocolate whey protein isolate, that’s exactly what you’ll get. Whey protein is being studied — not just for its effects on muscle protein synthesis — but on gut health. Whey is rich in growth factors that encourage the growth of anti-inflammatory molecules that cause gut irritations and diseases like IBD, Crohn’s, and ulcerative colitis. It’s being studied as a therapy to help repair and maintain the tight junctions in your gut lining that responsible for nutrient absorption[*][*]. MCTs in Perfect Keto Nut Butter or MCT oil may positively impact your gut microbiome[*]. And coconut milk also contains gut-friendly MCTs and electrolyte minerals that nourish gut health. Cocoa acts as a prebiotic in your gut, making it great for keeping your gut microbes diverse and healthy[*]. This creamy, chocolatey shake is the perfect low-carb breakfast, especially for busy mornings. And with just a few ingredients, you won’t have to worry about prep time or clean up. Even better, it’s likely you already have most of these low-carb, keto ingredients in your pantry. Prep all your ingredients ahead of time for even faster prep. Want to mix it up? Add some frozen strawberries for a keto diet-friendly chocolate-strawberry smoothie or try this delicious, veggie-packed green smoothie. Add all ingredients to a high-speed blender, blending on high until smooth. 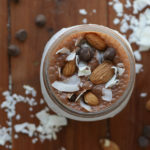 Top with Perfect Keto Nut Butter or almond butter, cacao nibs, coconut flakes, and nuts, if desired.